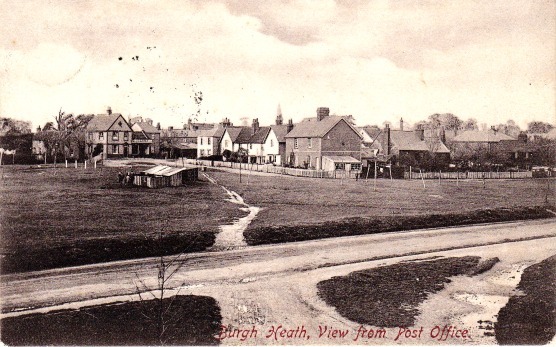 An interesting postcard of Burgh Heath in 1909 – ‘View from Post Office’. The card was published by G.P. Roberts, Burgh Heath… that would be Gilbert Peterson Roberts, who ran Roberts Stores and the very same Post Office. The marks on the upper left of the photo are caused by a very heavy postmark, which has leached through from the other side. The postmarked date is August 10 1909 and the card is addressed to Miss D. Edwards, 22 Parkhurst Road, Sutton, Surrey. Left to right Privits Store, Cottages, School House lived in, then Lewis House, Mr Glue, Mr Tarranie Swiss Yodeller made records availalble (Hopkinson},Mrs Farly owned the pigsty on the common also Green grocery then 2nd Mrs Farly then Ivy Cottage then Removel corner store . I remember Harry Tarranie, he gave me singing lessons when I was living at the Surrey Yeoman in the 1940s .